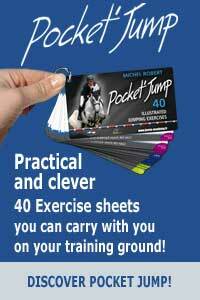 This jumping session takes place after a flat work session that sets the base of the good horse-rider connexion. Day Dreamer tends to get worried and to rush to get rid of the fence. 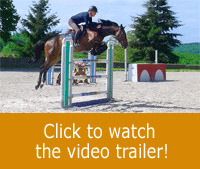 The goal of this session is to obtain a horse that stays calm and steady on the approach and landing jumps. For that, we need to make him focus using some specific exercises as well as using the good connexion Marine was able to establish on the preliminary flat work. Michel sets-up some exercises that will enable Day Dreamer to focus and be serein before and after a fence. Marine, the rider, implements Michel’s advice regarding her position and her mind frame in order to reassure her horse. At first, approaches are successfully managed. After practising the exercise several times, Day dreamer stays steady and approaches fences calmly, without rushing. However, he keeps rushing when landing out of the line, Michel adjusts the exercise to get the horse to be more focused and to push from behind to maintain a steady canter. By the end of the session, the horse goes over the line calmly. We can notice that it helped improve his jumping technics. He goes over the grid and then turns behind it in a steady rhythm with a good engagement of the hind-legs.
. Use your side-way vision when the horse has a tendency to pull when approaching fences.
. With a nervous horse or a horse that rushes to fences, do not try to hold him at all time, but on the contrary, get a stronger canter going to the fence and closer to the approach decrease the speed.
. Keep in mind that there is “a life” after the fence. So stay connected including after the fence especially to reassure your horse.